In 2010, more than a quarter century after President Reagan established a U.S. Exclusive Economic Zone stretching 200 miles out from America’s shoreline, a vast marine domain six times the size of the Louisiana Purchase, President Obama signed an executive order to promote a National Ocean Policy for the United States. Right now our public seas and waters are administered by more than 20 federal agencies, along with a welter of state, local and tribal authorities under 140 separate laws with little or no regard for the cumulative impacts of competing and often overlapping uses of our coasts and ocean. The result: citizen stakeholders are drowning in red tape even as our marine ecosystems continue to degrade. Beginning with our 2009 Blue Vision Summit Plenary on National Ocean Policy (NOP) attended by the head of the White House Council on Environmental Quality, Senator Sheldon Whitehouse of Rhode Island and others, and working with hundreds of marine activists Blue Frontier helped launch, coordinate and strengthen advocacy for NOP and effective policy implementation. An example of why a comprehensive policy approach is needed was reflected in a decision by the Department of Commerce to ban commercial fishing in 250,000 square miles of climate-impacted Arctic waters north of the Bering Sea until the effects on this rapidly changing ecosystem are better understood. That decision was supported and encouraged by both commercial fishermen and environmentalists. At the same time the Department of Interior continues to issue oil and gas drilling permits in these same high-risk waters ignoring the precautionary principle (“first, do no harm”) being practiced by its sister agency. A comprehensive National Ocean Policy will prevent this kind of inconsistent stove piped approach to managing our public seas. For a report of the six public hearings please click here. On November 19, 2009 Blue Frontier Campaign sponsored a Lessons Learned/Next Steps meeting for Seaweed Activists at the Carnegie Institution in Washington D.C. Some 40 people representing several dozen groups participated live and by phone. We agreed to follow through on the success of the public hearings with a ‘Wear Blue for the Oceans’ Day January 13, 2010 calling for the President to issue an Executive Order enacting a strong national ocean policy on receiving the final report of his Task Force. Wear Blue Day, January 13, 2010 proved to be a huge success with rallies and events in more than a dozen cities including D.C., San Francisco, New Orleans, Cambridge and Honolulu and many more organized through social media on Facebook, twitter and at the www.wearblueforoceans.org website where many of these first national events and group images in support of our Oceans and Great Lakes are now archived. 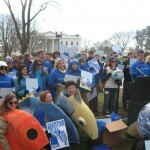 In Washington D.C. 75 people in blue “Protect Our Oceans” tee-shirts (pulled over their winter coats), also in fish costumes and carrying colorful placards and inflatable globes gathered in Lafayette Square in front of the White House for ‘Wear Blue for Oceans Day,” to support a strong national ocean policy. Among the speakers was David Helvarg, founder of Blue Frontier, “Sherman’s Lagoon” cartoonist and illustrator of “50 Ways to Save the Ocean,” Jim Toomey, Sean Cosgrove of the Conservation Law Foundation and his daughter Lucy (who preferred pink to blue), Mike Dunmyer of Ocean Champions, ex-government official Mike Nucklos, Julie Lawson, Chair of Surfriders D.C. Chapter, Marine Conservationist Wendy Benchley. The group then marched across the park to pose in front of the office of the White House Council on Environmental Quality whose chair, Nancy Sutley, was leading the President’s Ocean Policy Task Force. 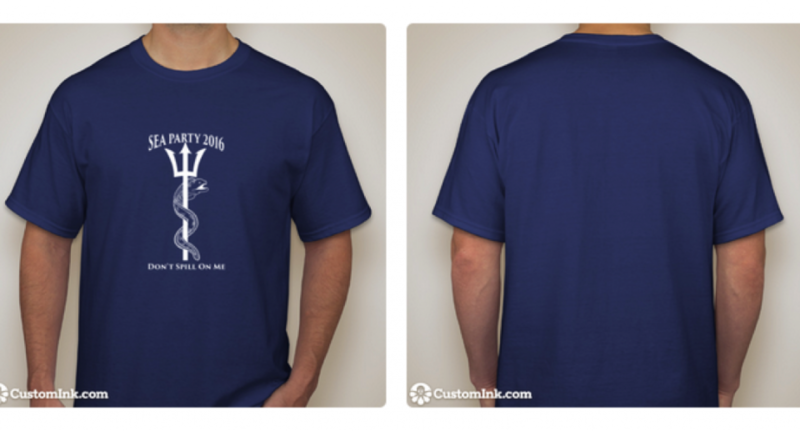 A “Protect Our Oceans” Tee-shirt was given to her assistant to pass on to her. 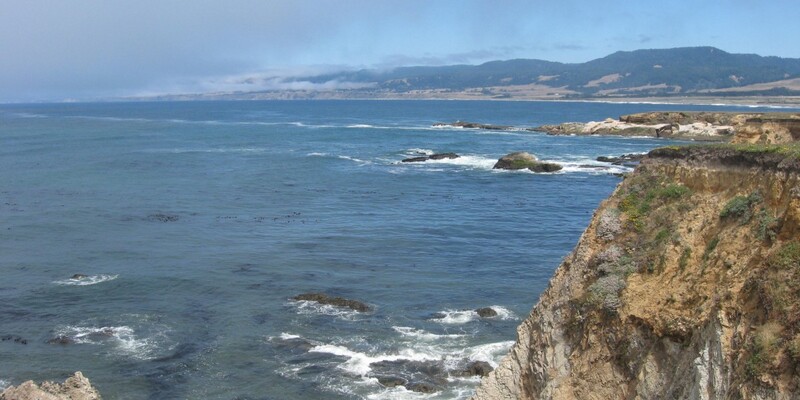 On July 19, 2010 President Obama signed Executive Order 13547 to adopt the final recommendations of the Interagency Ocean Policy Task Force to implement a new National Ocean Policy. It quickly came under partisan attack in Congress. Blue Frontier’s David Helvarg wrote several articles for various media outlets about this conflict, even as regional groupings of federal, state, tribal and citizen groups began to work to implement this more commonsense approach to coordinating the environmentally sustainable use of our last great commons. In 2013’s Blue Vision Summit Healthy Ocean Hill Day constituents from more than 20 states met with their elected representatives and staffers in Congress to advocate in support of NOP and other marine conservation causes. On May 12, 2015, the 2nd day of the 5th Blue Vision Summit Beth Kerttula, the Director of the National Ocean Council in CEQ (that’s charged with implementing NOP) was one of the speakers on our opening plenary on ‘Living with a Changing Coast and Ocean.’ The 5th anniversary of NOP was also marked by a video team invited to BVS5 to record congratulatory messages from the hundreds of participants. Blue Frontier will also work to make sure the next White House administration and Congress continues the work of building a sound regionally and environmentally based policy for America’s Public Seas and for restoring the blue in our red, white and blue. Please watch this space or subscribe to Blue Notes to be kept up to date on the U.S. National Ocean Policy.